Shelter can be as simple as a dog house and a run. They are strong, like to climb and head but, so the fence needs to be very stable and at least 4 feet tall. A couple could be kept in a run of 8' by 8'. The horns are typically burned off when the kids are onle a few days old. A horrible procedure, but without it, they will be a real danger to humans and one another. Very small (rabbit sized) poop that has a very slight oder. Apparently not aware of their bowel movements. Some seem to be able to avoid urinating in their bedding, but most poop and pee at will. Bedding and yard must be cleaned regularly and bedding replaced often. Unless the yard is slanted and the bedding is on grates over a slanted floor. If you think about it. Goats live mostly on the side of hills. Just like with the chickens, having a cockeyed view results in compost rather than labor. 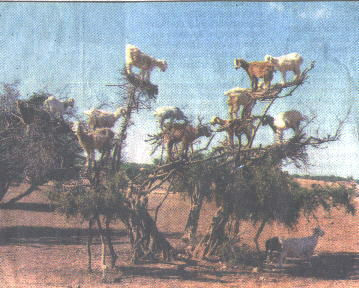 In fact, the goats are heavy and active enough that they should do a great job of seperating the dead leaves from tree trimmings and may even break up twigs. If the goat pen is above the run and on a gentle slope, any uneaten leaves will fall right in to the run for the chickens to finish composting. All I have to do is trim the trees, dump that into the goat pen, then remove the larger branches when they are stripped. Does have little or no smell but the Bucks can smell very bad. Wethers (nutered males) don't smell like Bucks. Of course Wethers are useless except as company for a single Doe or as a pet. Very social (like dogs) but even more so. They do not do well alone and should be kept in pairs. Each animal is very unique with a different personality and behaviors. Some are quiet, others are loud. Some are trusting and others flighty. They like to climb, but with a height of only 17 to 22 inches, a standard fence with chicken wire to about 3 feet is enough to keep them in, as long as there isn't anything near the fence. Does lactate only after giving birth so they must be bred if they are to produce milk. They can be bred when they are produceing but they need at least two months towards the end of the pregnancy without milking so that they can build up calcium in their bodys for the kid. Typical schedual is 7 months of milking then breeding, then 2 more months of milking and taper off over a month for 2 months of no milking untill the birth. Typical production is between 2 cups and a quart per day per doe and the milk tastes like... milk! You couldn't taste the difference from whole milk if you tried. It is NOT like the milk from larger goats. Does cost between $200 and $800 dollars. Wethers can be used as companons and are generally low cost or free. Bucks are a little less than Does. http://www.biconet.com/critter/barkStopPro.html Line powered, outdoor unit for an entire area. http://www.biconet.com/critter/dogOff.html Small, low cost, personal unit with manual activation. Could be used to test. http://www.ansci.cornell.edu/courses/as305/217perception.pdf Goats hearing extends to 37KHz, humans do not hear above 20KHz. Bark suppresion devices target the range between 30 and 40KHz since dogs can hear up to 44KHz. It is very likly that a unit designed for a dog would also be effective with a goat. Interestingly, birds (at least turkeys and ducks) do not hear above 7KHz, so it is also likely that chickens would NOT be affected.